It has been shown that tap water treated with Water Preserver™ Concentrate (a blended proprietary formula of 5.25% Sodium hypochlorite solution), stored in containers suitable for long-term drinking water storage, will remain potable for up to 8 years. It has also been shown that a quantity of water can be stored for a minimum of 10 years total by re-treating the water after 2-3 years. Two continuous parallel Studies (Study #1 and Study #2) were performed on split samples of water taken from one original water sample. In Study #1, potable domestic tap water was treated with Water PreserverTM. The water was stored in a 55-gal. drum for 29 months (2 years and 5 months) and then analyzed. In Study #2, the water from Study #1 (after analysis) was transferred from the drum and split into three individual 2.5 gal. containers. Two of the containers were treated with Water Preserver™ at the recommended rate of 8 drops/gal. and then stored. One container was left untreated and kept as a control sample. Split samples were analyzed at 29, 37, 48, 63, 82, and 96 months. STUDY #1. Results of bacteriological analysis showed the stored water continued to meet drinking water standards after a 29-month storage period. STUDY #2. Results of the bacteriological analysis showed the untreated control sample to contain unacceptably high levels of bacteria in the water. However, the treated water met drinking water standards at each of six storage intervals, over an 8-year storage period. It was concluded that both of the container types used in the Studies are suitable for use with Water Preserver™ and as containers for the long-term storage of water. In addition, the "age" of the water (i.e. water directly from the tap vs. tap water that as has been in storage for up to 29 months) is not a factor in the effectiveness of the Water Preserver™ treatment. Based on results of bacteriological analysis from Study #1 and Study #2, it was concluded that Water Preserver™ is effective in preparing domestic (potable) tap water for storage of up to 8 years, for use as emergency drinking water meeting all common drinking water standards. Therefore, current 5-year storage recommendations on the product label are validated and, in fact, provide a 60% storage life safety factor. In Study #1, potable domestic tap water was treated with Water Preserver™. The water was stored in a 55-gal. drum for 29 months (2 years and 5 months) and then analyzed. In Study #2, the water from Study #1 (after analysis) was transferred from the drum and split into three individual 2.5 gal. WaterCube™ brand containers. Two of the containers were treated with Water Preserver™ at the recommended rate of 8 drops/gal. and then stored. One container was left untreated and kept as a control sample. 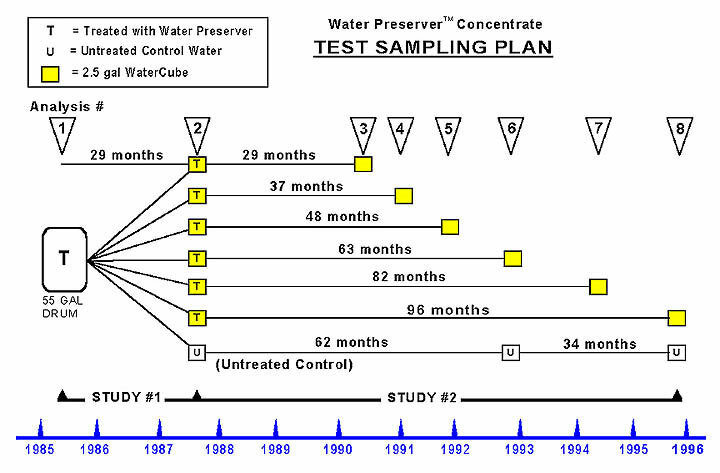 Split samples were analyzed at 29, 37, 48, 63, 82, and 96 months.